One day in Istanbul last Summer, I took a bus from Taksim to Rumelihisarı and, after half an hour drive, got off in front of a nine-storey building that overlooks the shiny waters of the Bosphorus. 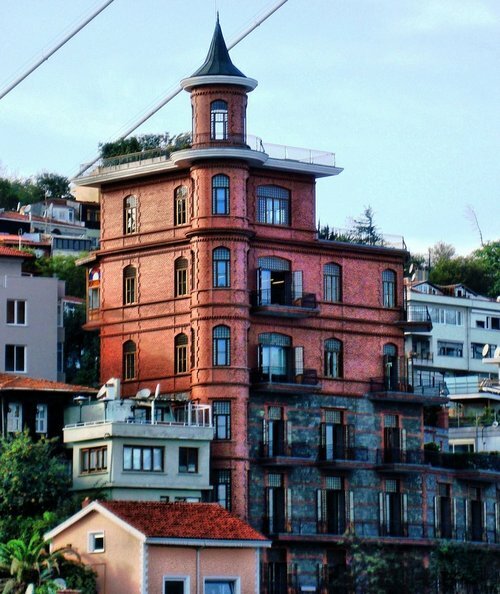 A red-brick mansion built in the 1910s, locals have come to know the place as Perili Köşk, which, in English means, “The Haunted Mansion.” Perili Köşk is the headquarters of Borusan Holding, a massive Turkish firm that sells steel products, including general purpose pipes. The building itself is located close to the steel legs of the Fatih Sultan Mehmet bridge and, once inside, you get a nice view of the interiors of numerous vehicles—some of which Borusan sold to customers as Turkey’s distributor for BMW, Mini and Land Rover cars—stuck in between Asia and Europe. Dressed in casual attire I looked at the brick-colored façade of the Haunted Mansion which has the shape of a creatively re-imagined stack of Tetris blocks, and walked toward the doors, which were wide open, despite it being a Sunday morning. A security guard greeted me at the entrance. I was not carrying anything business-related with me—just a tote bag with a small bottle of cold water, a Moleskine reporter notebook, and Nikil Saval’s book Cubed: A Secret History of the Workplace. I feared the book would get wet because of the water bottle, so I took the book outside. The security guard looked at its cover with interest and did not ask for my ID or security pass. Then he asked whether I wanted a normal ticket or a reduced pass. Perili Köşk is the Dr. Jekyll and Mr. Hyde of Istanbul’s office buildings: during the week, it serves as Borusan Holding’s headquarters—a site of commerce and capitalism—and on the weekends, it becomes the Borusan Contemporary, an art museum with the entry fee of 10 liras. Walking among desks on the fourth floor I saw pictures of office workers’ relatives. This proved to be an unsettling experience. I wouldn’t be so keen on my pictures being spied upon by total strangers, after all. The open plan design of the office made it easier to see things. I saw favorite stationary objects and colorful post-its of workers. I saw folders carefully placed on tables. I saw notebooks whose pages I assumed were blank. A blanket was placed in a corner, as if waiting for the weather to become colder. In one of the upper floors, where there are old-fashioned offices of high ranking executives, I saw large ashtrays on tables which looked forward to the moment when their owners would smoke cigars and cigarettes whilst enjoying the view of the Bosphorus. In the open plan office downstairs a security guard eyed me as I walked around tables. Another security guard, who waited on the floor of executive offices, had a more difficult job. He had to follow me, and all other guests, to every single room we entered, like a shadow. The experience of inspecting people’s offices was akin to inspecting Tracey Emin’s “My Bed” at the Saatchi Gallery. Having worked at various offices between the ages fifteen and thirty, I still remember the feeling of the bed-like privacy of one’s workspace. Pads, condoms, and underwear placed around Emin’s bed translate, in the worker’s office, to notepads, mouse pads, and pencil sharpeners. When I started working at Turkey’s first major internet company as a teenager, I thought this was life’s way of offering me a second bedroom. That nobody but I could see the mouse pad on my desk. I longed to be there, in that second bedroom, during classes at school. 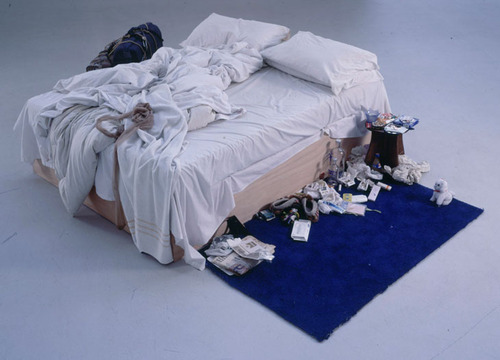 “My Bed,” Tracy Emin. 1998. Mattress, linens, pillows, objects. 79 x 211 x 234 cm. “Privacy is a privilege,” as Roxane Gay has written in a recent essay on the violation of women’s privacy online, “little more than an illusion, one we create so we can feel less vulnerable.” In “Cubed” Nikil Saval describes how the hierarchy of the Victorian office has been maintained through the allowance of privacy for certain office workers, namely the clerks, and the denial of that right to others. Employers allowed the small staff of privileged clerks to use a higher desk placed in the corner of the office; in the pigeonholes of those desks the clerks would store office files which became inaccessible to co-workers, thanks to the office architecture. One feels for the clerk who loses his power through this specifically designed scheme that terminated his privacy. From then on, the power lay with the gaze of a new class of managers. In the twentieth century, when CCTV cameras were installed inside office buildings and managers designed more cunning methods of surveillance, the privacy of the worker dwindled further. The Haunted Mansion’s office museum concept works both ways. Everywhere in the building there are examples of good old contemporary art (the collection includes wood prints by Sol LeWitt and photographs by the Palme d’Or winning film director Nuri Bilge Ceylan). Video installations are placed behind desks of managerial offices in the manner of traditional paintings. On the staircases rows of plasma screens display visually demanding works by contemporary artists, like Jesse Fleming’s “The Snail and the Razor” which documents the interactions between a snail and an erect razor blade—perhaps a metaphor for the relationships between workers and their erect bosses? In any case, it is certainly not one of those peaceful landscapes that relax the office worker during coffee breaks. When he is absent, the Perili Köşk office worker’s space itself turns into art; when present, the art furnishes his walls like a bedroom. Back in the office downstairs I found that the waste bins were empty. I saw stacks of paper waiting for their surfaces to be exposed to the Xerox lasers. Not in this Sunday sunshine. Wait for a few hours more, until security guards and art visitors leave the office to workers who are ready to devote their hours to the gentle art of moneymaking. Perili Köşk is haunted by the absence of both its workers, whose working space it is, and the manual laborers who have started building it more than a century ago, in 1910. As you walk around the Mansion, whose masonry structure is 46 meters tall, the specters of those Ottoman workers, who had been sent to the front during the First World War, refuse to leave you alone. It is like a poem left incomplete because some ghastly shell has landed on the head of its poet. The building was commissioned by the Ottoman Empire’s ambassador in Washington, Yusuf Ziya Pasha, a sophisticated statesman responsible, among other things, for setting up his country’s first state music school. A high-ranking employee of the Ottoman Foreign Office, Yusuf Ziya Pasha had enjoyed the support of the state apparatus and was advised by Egypt’s Ottoman viceroy Abbas Hilmi Pasha during the mansion’s construction. When in 1914, the leaders of the Committee of Union and Progress party led the country into the First World War on the side of the central powers, all able-bodied men were forced to enlist in the army. The Dutch historian Erik-Jan Zürcher notes that the number of Ottoman deserters during the war had “increased to nearly half a million, a number far higher than that of the soldiers remaining in the field”. The workers who built the Haunted Mansion, apparently, were not among those. After the departure of the workers, Yusuf Ziya Pasha moved to the unfinished Mansion with his second wife and their step-daughters. Two of the building’s nine floors were left unfinished whilst they lived there. Rumor has it that Istanbul’s winds howled in such an unsettling way through those floors that the Rumelihisarı locals were terrified. In their eyes, this provided enough material for theories about ghosts haunting the Mansion’s empty floors after midnight (according to a second theory, the building derived its name from one of its inhabitants who had a fairy-like beauty; in Turkish the word “Perili” means both “haunted” and “inhabited by fairies”). In 1926 Yusuf Ziya Pasha died and his family decided to continue living there. By then The Haunted Mansion had turned into a remnant of a bygone age. It represented the final years of the empire whose power made its construction possible, as well as that of the workers who had built it with their own hands. After Borusan bought the building, Turkish architect Hakan Kıran undertook the task of restoring it. “The stone and brick coating of the façade was finished in harmony with the original architectural plan after the brick materials were imported from England,” the Borusan website informs us. “According to the specifications of the project, 2,800 m³ of concrete and 350 tons of iron were used in the construction. While preserving the external appearance of the mansion, the internal spaces were arranged so as to provide a modern and spacious business environment.” This modern and spacious environment will continue to be the private property of the company, at least until 2030, when Borusan’s lease agreement on the mansion will come up for renewal. There is a large, bossy leather chair on the sixth floor of Perili Köşk. Sitting on it, surrounded by plasma screens, you may be excused for feeling a bit like Gordon Gekko of Wall Street fame, who spent his life making money through careful inspection of screens. The videos around you tell the story of Asım Kocabıyık, an Anatolian entrepreneur who founded Borusan in 1944. There are photographs of his youth, of his first years in the business, and of the time he spent in England. He died in 2012, months after the headquarters of his business empire were transformed into an art space by his son. This floor is devoted to Asım Kocabıyık’s business activities and features panels decorated with hagiographic texts, instead of contemporary art works. As I read the life story of this Anatolian entrepreneur, I thought about the chapter in Saval’s book that describes how form started following finance in American offices. As I got ready to leave the building, I admired this Anatolian entrepreneur who has renovated this building placed at the very border of the European continent. He had turned it not into an office that would be eminently rentable to future owners, but one that has a character of its own. The Mansion of the Anatolian entrepreneur became one that is about art and work; and about how they interact. My favorite work in the building, Iván Navarro’s “Exodo” (2008), provides a promise of escape from the work environment through art. Made of neon, plywood and mirror, “Exodo” resembles a well that might function as an escape tunnel out of the office. Its black, glassy structure invites you to bend over and disappear inside. Just below the surface you see the word EXODO, made up of neon lights, which dazzlingly repeats itself dozens of times, from the surface to the unseeable centre of the earth. This Biblical call of escape from slavery may be said to summarize dreams of many office workers around the world, presumably even some of those who work in post-modern and artsy museum offices like The Haunted Mansion.